Months of hard work and an ongoing labor of love all came to fruition this May, when the Good News Seminary graduated its fourth class and largest class of students. Among the seminary students were those receiving Baccalaureate degrees, and for the first time and we also awarded Masters degrees in Pastoral Counseling and Theology. In addition, several Business School graduates received their hard-earned diplomas. During their two-year course of study, the Business School students received a wealth of business knowledge from Kelsey Schwartz, one of the seminary instructors and a successful businesswoman herself. Other teachers also contributed to their knowledge. 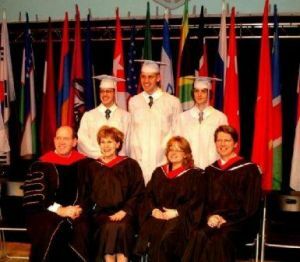 Tyler Young, Joel Renner, and Trevor Young graduated from high school this May after spending many hours in classes here in Russia with their teacher and friend Bob Dickerson, who is a certified teacher from the state of Missouri. We're proud of all our graduates, and we know they will go forth and do great and mighty things in the Lord, fulfilling the unique callings upon their lives. We consider it an honor to have had a part in training them as they go on to pursue God's plan for their lives.